The French Trump declares war against "Savage Globalism"
On Trump and Brexit: "They also said that Brexit wasn't going to happen, that Donald Trump wasn't going to be elected, wasn't even going to be his party's nominee. Well, they're saying that less and less now." 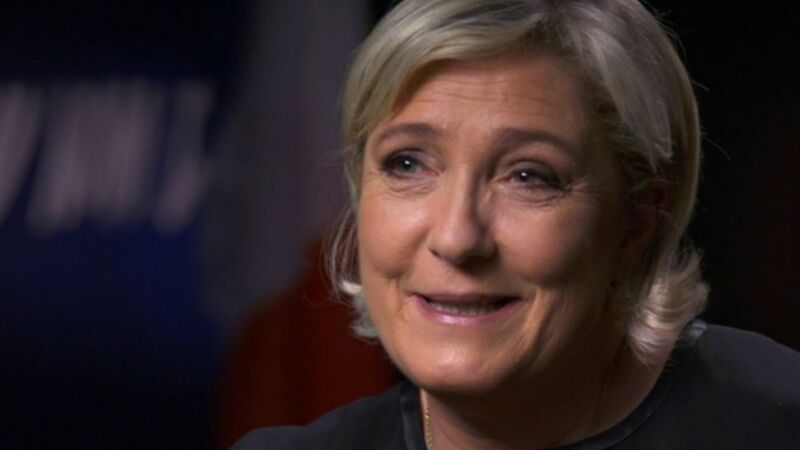 On Russia: Le Pen said it's a "big scam" to claim Russia is a threat to Europe, rejecting Cooper's question about Vladimir Putin as a threat to the region. On whether global elites went too far: "Globalization has become an ideology with no constraints. Now nations are forcing themselves back into the debate. Nations with borders that we control with real economies, not Wall Street economies, but rather factories and farmers. This goes against unregulated globalization, a wild, savage globalization. Wild globalization has benefited some, but it's been a catastrophe for most." On how immigrants change France: Le Pen said it's "undeniable" that some neighborhoods in France no longer allow you to live a French life. But Le Pen said that foreigners in France who "hold a job, who respect our laws, our codes, have absolutely nothing to worry about." QuoteFrance isn't Burkinis on the beach. France is Brigitte Bardot. That's France. A big challenge: Getting past the legacy of her father, Jean-Marie Le Pen, who founded the party she now leads. The elder Le Pen was expelled from the party in 2015 after a history of anti-Semitic and racist comments.